The North and North-West of the State appear set to finally return to the economic spotlight with a series of much needed projects moving from concept to reality, stimulating local business and increasing confidence. Much of the growth in the Tasmanian economy over recent years has focussed on the south, with the so-called MONA-effect driving growth and tourism in the Hobart area. This has overshadowed economic development in the North and North-West, but it appears the regions are poised to catch-up with the Launceston City Council alone having half a billion dollars of projects ready to go, such as the UTas relocation to Inveresk. The North West has more than $150 million infrastructure project planned for this year with one of two wind farm projects costing between $1.2 billion and $1.6 billion expected to be investment-ready in this financial year. 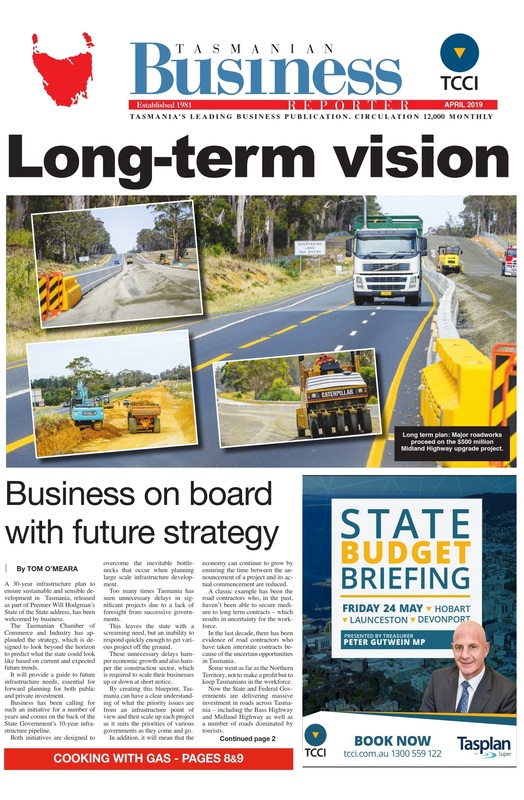 Hobart will continue its strong economic growth with the $550 million new Bridgewater Bridge development to be announced before the March State election and funded by Federal and State governments. While money has not been assigned to various projects recently in Federal and State budgets, there are substantial unallocated infrastructure funds available for a rainy day. Budget papers suggest the Federal Government has more than $10 billion available for “unexpected” projects and the state about $200 million depending on the final wash up of the 2016-17 budget figures. This also allows $200 million to $300 million to address the third world sewage problem in the Tamar River and associated water supplies. Current spending projects in the North include the Silos Hotel ($20m), CH Smith development ($20m), Health including the LGH ($55.8m), Launceston City Deal and University relocation ($300 million) and major renovations and expansions at Queechy High School ($5m), Riverside Primary ($2.5m), Riverside High School ($12m) and East Launceston Primary School ($4.5m). North West spending includes $50 million for the NW Regional Hospital and Mersey Community Hospital, $27m for school developments with $10m for Latrobe High School and $9.1 million for Parklands, $40 million for the UTAS campus, $9.5m the restart of the Mt Lyell mine and $20 million for the much needed revamp of facilities at Cradle Mountain. Parallel with the infrastructure growth is the State Government’s incentive schemes, introduced on July 1 to encourage business to employ apprentices, trainees and young people. The major package costing $17.1 million is now available to around 2500 businesses employing about half of Tasmania’s workforce. Businesses employing a new apprentice, or trainees will now be exempt from paying payroll tax for those new employees for two years. If the employee is aged between 15 and 25 and isn’t a trainee or an apprentice, the employer will eligible for payroll tax for 12 months. Businesses who don’t pay payroll tax – those that don’t have a payroll over $1.25m – will be eligible for grants of up to $4000 to employ a trainee or apprentice. Treasurer Peter Gutwein said the incentives were expected to create up to 7000 jobs which would be needed to sustain the economic growth particularly with infrastructure, tourism and hospitality. The youth employment strategy is an additional assistance and involves support programs such as the $4.1million TasCOSS-TCCI project to remove barriers limiting job opportunities for young people such as transport. Workforce for Now and the Future will also help young people get a drivers’ licence by blending driver training with education and vocational training. TCCI Chief Executive Michael Bailey said the Chamber had been advocating on behalf of members for payroll tax relief from the government. “Not only is it a terrific incentive for business but the approach by the State government is unique when you consider the Tasmanian economic environment. Normally such financial relief is introduced during the really tough, depression times to save jobs,” Mr Bailey said.